* Please note that the values above are the signed compact amounts and do not reflect lower actual expenditures due to early terminations or funds for a compact not being fully spent. The table on the next page reflects the net obligations/commitments associated with each compact. Environmental requirements, including an improved regime for the disposal of sludge according to international standards. The Ministry of Water and Irrigation will soon float a tender for the construction of the first mono landfill for the disposal of sludge and bio solids and for electricity generation. 11,418 households, commercial and other legal entities received formal recognition of ownership and/or use rights. 28,985 parcels were corrected or incorporated into an official land information system. 100% of targeted surfaced area on Sal Island has been incorporated into the Land Management Information and Transaction System (LMITS). 38 land administration offices were established or upgraded. In partnership with the Coca-Cola Africa Foundation, the Social Access Fund increased access to water and sanitation with over 3,500 households receiving subsidized water connections and more than 2,200 households benefiting from new sanitation facilities. Construction of over 200 km of water pipeline and over 20 km of sanitation pipeline. More than 60 reservoirs and pumping stations constructed or rehabilitated. The infrastructure improvements of the Water and Sanitation Fund supported utilities to improve or expand or improve their water and sanitation networks. On Santiago Island, transformation of the water sector, including establishment of a new corporatized, consolidated utility—Aguas de Santiago, with more efficient and effective operations and management— has resulted in more than doubling the number of hours of water service many residents on the island receive per day, which has increased from about 6 hours to over 14 hours per day. The Compact introduced an infrastructure grant facility to fund infrastructure works in the WASH sector. This innovative funding mechanism has inspired the Government of Cabo Verde to create a revolving fund to continue to fund the sector. An independent evaluator is implementing a mixed methods performance evaluation to assess the impacts of LMI Project on investment in land and property, property values, land tenure security, time to process key land transactions, demand for formal land transactions, and tourism growth, as well as sustainability of the new systems and procedures introduced by the Project. The evaluation includes three complementary components: a trend analysis examining changes in key outcomes over time using secondary data, a qualitative study collecting two rounds of in-depth interviews and focus groups with households and businesses to help interpret the findings from the trend analysis, and a multisite case study of large tourism related commercial investments to capture planned and actual investments in tourism development zones (known as Zonas de Desenvolvimento Turístico Integral, or ZDTIs) to understand how the project affected these investments. Given the concerns around women’s land rights, the evaluation will also include an analysis of how women’s land rights were captured in the clarification of rights and boundaries process and whether women and men benefit differently. In support of the monitoring and evaluation, LMI stakeholders are collecting detailed land administrative data across multiple land and investment offices regarding key land transactions (sales, greenfield investments, mortgages and building permits) to better understand how the new Land Management and Information Transaction System (LMITs) and related clarification of rights and boundaries affects time to process a land transaction, demand for land services and related land markets. The evaluation is anticipated to be completed in 2020 after a 3-year exposure period, with a final report in 2021. MCC has contracted an independent evaluator to (1) document how the project activities were implemented along with key outcomes of those activities; (2) track changes in outcomes among households who received subsidized connections to the water network on Santiago through the Social Access Funds; (3) assess utility-level outcomes that are expected to be affected by the WASH project activities; and (4) evaluate how FASA funding might have incentivized utilities to corporatize, how households and utilities are affected by the infrastructure, and consider the prospects for the infrastructure to be sustainably managed. The evaluation is scheduled to complete an interim report in fall 2018 and a final report to be submitted in 2022. Approval of modifications at the appropriate level. MCC also conducts due diligence on programs in advance of compact signing to increase the reliability of technical, cost, and other estimates. During compact development, MCC makes project design modifications to mitigate potential completion risk, currency fluctuations and the potential for construction cost ovERRuns. Indonesia Green Prosperity Project / Green Prosperity Facility Activity ($242 million) Reallocation of $12 million of funding from the Green Prosperity Facility to Technical Assistance and Oversight During finalization of the Green Prosperity (GP) Facility portfolio in mid-2016, MCA-Indonesia identified budget shortfalls for technical assistance and oversight. The funds are needed for program administration, oversight, and identification of new initiatives to mitigate implementation risks and improve project sustainability. Such support will help improve the chances of successful implementation of the project grants, and aid in the delivery of GP grant outputs. Indonesia (Cont.) Procurement Modernization Project Reallocation of $7.7 million from the Program Administration and Control Activity to the Procurement Modernization Project’s Procurement Professionalization Activity The reallocation of funds was designed to help ensure project sustainability by including additional workshops, which would help expand socialization of key concepts, develop a competency-based professional certification program, and improve project investments under implementation. Moreover, MCA-Indonesia’s assessment showed that logistics costs for the project exceeded estimates, and additional support was needed to continue human resources development training with the projected beneficiaries to ensure program sustainability. Indonesia (Cont.) Procurement Modernization Project Reallocation of $2.2 million from the Program Administration and Control Activity to the Procurement Modernization Project’s Policy and Procedure Development Activity The objectives of the Public Private Partnership (PPP) Sub-Activity are to develop Policies and Procedures on PPP Procurement, and Bidding Documents to facilitate the implementation of PPP procurement across a diverse set of economic and social sectors. Piloting of these projects requires identification and close cooperation between MCA-Indonesia and the Government of Indonesia as well as the selected PPP proponents. After evaluating the quality of existing pre-feasibility studies for the selected pilots, it became clear that the additional funds are needed to refine the existing studies in order for the PPP Sub-Activity to advance with the bidding documentation and the actual piloting of the new procurement policies and procedures. Ghana Northern Electric Distribution Company (NEDCO) Financial and Operational Turnaround Project Approval by MCC management of a redesigned NEDCO Financial and Operational Turnaround Project in the amount of $54.2 million MCA-Ghana worked with MCC‘s Ghana country team to redesign the NEDCO project. The redesign, which was completed at the end of 2016, resulted in several material changes to the following activities: the Private Sector Participation Activity, the Modernizing Utility Operations Activity, the Tamale Service Area Improvement Activity, and the Commercial Development Activity. The redesigned project passes the 10 percent economic rate of return hurdle and was approved by MCC senior management in January 2017. Zambia Infrastructure Activity Additional $22 million to be provided by the Government of the Republic of Zambia to support the completion of the Infrastructure Activity as originally planned During program implementation, it became clear that the cost to complete the Infrastructure Activity had increased due to unforeseen circumstances, including: Massive underground rock formations not detected during preparatory works; Change in the number of “Project Affected Persons” (persons losing assets because of the project who must compensated) and increased in-kind replacement of structures built in project corridors leading to increased resettlement costs; Underground utility relocations that had not been geo-referenced by utility companies that must be moved during construction works at a cost; Alignment of the detailed designs to adjust to changed circumstances in order to avoid high value impacts, and Increased costs associated with construction of the Bombay Drain. To mitigate this risk, the Zambians committed to contribute $22 million in 2017. Under MCC‘s results framework, beneficiaries are defined as an individual and all members of his or her household who will experience an income gain as a result of MCC interventions. We consider that the entire household will benefit from the income gain and counts are multiplied by the average household size in the area or country. The beneficiary standard makes a distinction between individuals participating in a project and individuals expected to increase their income as a result of the project. Before signing a compact, MCC estimates the expected long-term income gains through a rigorous benefit-cost analysis. MCC may reassess and modify its beneficiary estimates and the present value of benefits when project designs change during implementation. All MCC projects are independently evaluated, and these independent evaluations often include post compact ERRs. Independently calculated ERRs complement the closeout ERRs that MCC calculates at the end of the compact. Because independent evaluations occur 2-5 years after compact closure, independently calculated ERRs can offer an updated assessment of a project’s costs and benefits post-compact. However, these ERRs are still projections for projects whose benefits are often projected to last up to 20 years. Nonetheless, the independently produced post compact ERRs, which are based upon the best available evidence, complete the accountability loop in a way that is rare among donors. Two examples are below. MCC’s Farmer Income Support Project (FISP) was designed to reduce the damage to the incomes of 1.7 million Mozambican farmers due to Coconut Lethal Yellowing Disease (CLYD). This was to be accomplished through (i) short term surveillance, control, and mitigation services, prompt eradication of diseased palms, and replanting with the less susceptible Mozambican Green Tall coconut variety, and (ii) Technical advisory services to introduce crop-diversification options. Given projected benefits to farmers’ incomes and the costs of the program, MCC originally projected the project to have an economic rate of return of 25.1 percent. MCC’s Nicaragua Transportation Project was designed to stimulate economic development and improve access to markets and social services by reducing transportation costs. It upgraded and rehabilitated 68 km of roads, consisting of two secondary roads and a trunk road. MCC’s originally estimated an economic return from the project of 13.2 percent based on reduced vehicle operating costs and travel time savings for road users, including those who would travel on the road due to improved road conditions resulting from the project. Numbers are cumulative since the agency’s founding in 2004 and current as of September 2017. Once a country is selected as eligible to develop a compact or threshold program, the first step in MCC’s process is to work with partner country officials to conduct a rigorous, joint analysis that identifies the most binding constraints to economic growth. 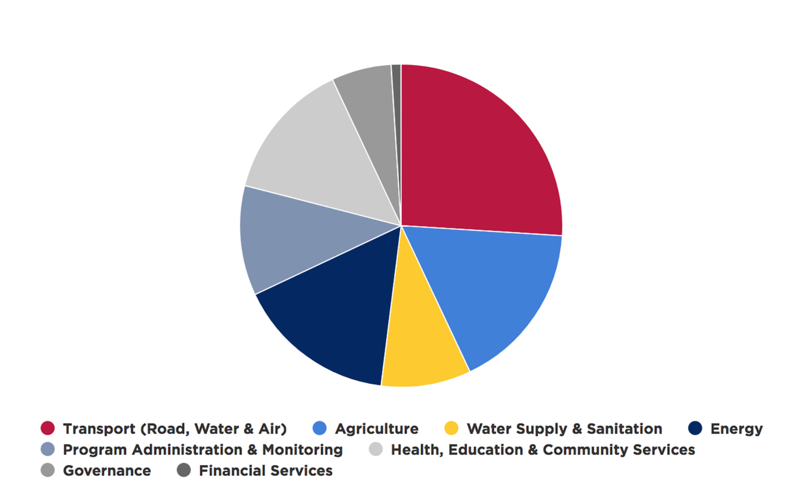 These results help prioritize MCC’s investments in the areas that are the biggest impediments to private investment and poverty reduction and may include access to credit, governance, electricity, transportation, or education. Constraints to growth are different for each country and ultimately drive MCC’s investment strategy. Below are highlights of MCC’s sector investments that have emerged from this analysis. MCC is making major investments in the energy sector to reduce energy poverty in Nepal, Benin, Ghana, Liberia, Malawi and Sierra Leone, while encouraging power sector reforms that complement infrastructure investments. In Liberia, MCC’s compact funds the rehabilitation of a hydropower facility to increase the amount of generated electricity, facilitate lower overall electricity rates, and increase the reliability and adequacy of electricity. In Ghana, the government took significant steps to revitalize its power sector by inviting the private sector to invest in one of its national distribution utility. Implementation of the compact with Benin continues while significant construction works for large-scale, on-grid generation, transmission and distribution projects are underway in Malawi, as well as smaller-scale, on- and off-grid energy projects in Indonesia. In Sierra Leone, MCC began carrying out its threshold program to build the capacity of the newly established power regulator and power generation and transmission utility. In Nepal, preparations are underway for the design of the transmission line funded under the compact. In addition, Kosovo’s threshold program will strengthen the power sector by fostering a market-driven approach to lowering energy costs for households and business, and developing new sources of electricity generation. In May 2016, the Philippines, using MCC compact funding, successfully completed the reconstruction/rehabilitation of 137.9 miles of a road in the Samar and Eastern Samar provinces of the country that will help lower transport costs and travel time and opens up possibilities for new markets. For the Niger Compact, investments were prepared for the upgrading of approximately 198 miles of roads to international standards, and enhancement of both national and regional connectivity. Implementation of technical assistance and policy reform activities that would set Liberia on a long-term path to a sustainable road maintenance were started. In Nepal, a comprehensive technical assistance program targeting capacity building in road maintenance planning and construction has been launched and includes plans to conduct the periodic maintenance of approximately 300km of roads. In Cote D’Ivoire, the design of major rehabilitation and upgrading of four (4) major urban corridors in the metropolitan area of Abidjan has been launched. In El Salvador, the construction tender for a capacity upgrading of the heavily trafficked segment of 18 miles of coastal highway has been completed and construction is scheduled to start in early winter 2018. MCC supports capital improvements and policy and institutional reforms to improve the level and quality of water and sanitation services in partner countries. MCC’s five year compact with Jordan, for example, closed in FY 2016 after investing more than $200 million for rehabilitation and construction of water supply and wastewater infrastructure including investment in the As-Samra wastewater treatment plant where treated effluent will be diverted for agricultural use saving precious bulk water supply for this water poor nation. MCC’s compact investment in Zambia is strengthening the main water utility company to improve billings and collections and provide more reliable service to its customers. In Sierra Leone, MCC is partnering with the government on a threshold program to implement policy reforms, build institutional capacity and improve governance in the water sector in Freetown. A comprehensive assessment of the water utility in Guma Valley was conducted to determine the priority areas of assistance for strengthening utility performance but because a cost-benefit analysis is not required for threshold program assistance, the estimated number of beneficiaries above does not include the Sierra Leone beneficiaries. 504,004 acres (203,963 hectares) under improved irrigation In July 2016, MCC signed a $437 million compact with Niger focused on strengthening the agricultural sector. Through the compact’s Irrigation and the Market Access Project, MCC will work with the Government of Niger to improve irrigation, including the rehabilitation and development of three large-scale irrigation systems in the Dosso and Tahoua regions, to increase crop yields, sustainable fishing and livestock productivity. In addition, the project will reform policies and institutions, including the establishment of a national water resource management plan and natural resource and land use management plans, and create local capacities to increase understanding of best-practices to sustainably use and maintain irrigation and market infrastructure. MCC works with partner countries to improve land governance and administration, strengthen property rights, and stimulate private-sector investment for more productive land use. In Cabo Verde, MCC has invested to reduce the time required to register property rights and establish more conclusive land records in areas with high development potential. MCC funding was used under a pilot activity to complete surveys for 100 percent of land parcels on the island of Sal, which are now being registered. This activity led to the passage of a legal amendment in August 2016 that streamlined the land survey and registration process. MCC is now funding the survey and registration of an additional 22,824 parcels on the islands of Boa Vista, Maio, and Sao Vicente. In Indonesia, MCC’s investment in natural resource management and renewable energy includes development of a methodology for community-based participatory mapping of village boundaries and cultural and natural resources. Following this methodology, villages are able to produce legally recognized village maps to enhance land use plans. As of September 30, 2016, MCC funding had assisted 114 communities in defining and demarcating the boundaries of their villages. Land and natural resource information systems were being installed in government offices in 35 districts across 10 provinces to provide decision-makers with the information they need to encourage investment while effectively supporting the management of their land and other natural resources. MCC works with partner countries to ensure that students obtain the knowledge and skills demanded by the private sector. In FY 2016, El Salvador officially announced its commitment to reform the technical and vocational education and training (TVET) system, identifying four transformative industries to target. The Salvadorians are establishing Skills Sector Committees for each of these four industries to define demand-driven training programs to feed into the overall technical and vocational educating training system. In Georgia, 26 schools have been completed, with another 3 on track to be completed by December 2017 and hundreds of students will be able to move into highly improved learning environments. Also in Georgia, more than 1,600 principals have been trained. The MCA-Georgia TVET Facility has awarded its first round of grants totaling approximately $12 million, slated to be disbursed in 2018. In September 2016, construction tenders were successfully launched for rehabilitation of pilot schools for MCC’s Morocco Compact. Also in Morocco, preparations are underway to field test an innovative Integrated School Improvement Model that will eventually be implemented in approximately 100 secondary schools, and planning advanced significantly for a TVET Grant Facility as well as a results-based financing component of the compact that aims to improve job placement for women and at-risk youth. In Cote D’Ivoire, MCC signed a Compact with the government in November 2017. The Compact includes an education project with investments in both secondary education and TVET. The secondary education activity will increase access to and the quality of education for students, while the TVET activity will introduce a demand-driven model of skills development with private sector governance. Further, the Guatemala threshold program now includes a TVET component. MCC works with partner countries to integrate sanitation, maternal and child health, and nutrition interventions to reduce stunting and increase household income. In Indonesia, MCC has committed more than $130 million to improve nutrition and health. MCC’s Indonesia Compact includes a partnership with the World Bank using incentives-based community grants to increase the demand for health, nutrition and education services and improves the health sector’s capacity to respond to increased demand at the facility and community level. In Sierra Leone, MCC has committed $5 million to improve access to reliable and safe water and sanitation (WASH) services, and to promote WASH practices at the household level. Increased access to safe drinking water, food, and sanitation services is critical to improving children’s nutritional status and preventing environmental enteropathy, which has been associated with growth failure in children. All program data are as of September 10, 2017. Data are preliminary and subject to adjustment. Grey shading indicates closed-out Compacts; data revision is not expected for these Compacts. Indicators in this Results Framework may be added, removed, or modified as MCC‘s investments in education evolve over time. All MCC education programs have as their long-term end goal an increase in individual or household income and a corresponding decrease in poverty. * Gender totals may not match overall totals due to lack of gender counting in earlier compacts. ** (E-5) Number decreased from 30 to 26 because it was misreported in the previous quarter. * Gender and location totals may not match overall totals due to lack of counting by gender and location in earlier compacts. All program data are as of September 10, 2017. Data are preliminary and subject to adjustment. Grey shading indicates closed-out Compacts; data revision is not expected for these Compacts. *Gender totals may not match overall totals due to lack of gender counting in earlier compacts. ** This is a monitoring indicator and cannot be attributed solely to MCC investment. *** Not all common indicator data for Liberia were included for this quarter as the data are still being verified. *** Not all common indicator data for Liberia was included for this quarter as the data is still being verified. *Gender and road type totals may not match overall totals due to lack of counting by gender and road type in earlier Compacts. ** The kilometers of roads completed for Mozambique is provisional data. Subject to change after verification of takeover certificates. *** According to the Common Indicator definition, a road is completed when official certificates are handed over and approved. In Senegal, this was taken to mean final acceptance of the road works, which typically happens after the end of the 1 year defects liability period which starts when the construction is completed and the roads are provisionally accepted. As part of its Compact, Senegal intended to rehabilitate 372 kilometers of national roads. By September 2015, when the Senegal Compact closed, no roads had achieved final acceptance, and therefore were not officially completed, per the common indicator definition. However, by the end of the Compact, 185km of roads had been fully rehabilitated and had received provisional acceptance. An additional 72km were provisionally accepted in November 2015, and the remaining 116km are anticipated to be provisionally accepted with the support of the Government of Senegal by mid-2016. ** This is a monitoring indicator; any change over baseline data represents the current trend and does not represent the direct impact of the MCC‐investment. *** Jordan’s M&E Plan has, throughout the life of the compact, defined hours of supply as hours/week. As such all documentation is in this form. The value here has been divided by 7 here to accurately reflect supply hours per day. ****(WS-8): In Cabo Verde II the utility is in transition and during this period it has experienced challenges with its billing system and low collection rates, which accounts for some of the high rates of Non revenue water. ****(WS-5): Number decreased due to a correction in previously recorded data in Cabo Verde II. *****The current unit for volume of water produced has a discrepancy. MCC M&E is in the process of revising this common indicator to clarify and align with current industry standards. For FY 2018, MCC management established four specific goals to guide agency planning and performance for the year. These goals build on MCC’s current strategic plan, NEXT, as the agency awaits incoming political leadership. As in past years, these corporate goals are the starting point for annual department and division goal-setting, from which staff develop their individual performance plans. Below you will find MCC’s FY 2018 corporate goals with a brief description of MCC’s progress to date. Advance and deliver high‐quality compacts and threshold programs. For program development, MCC is on target to present compact programs with Mongolia, Senegal and Sri Lanka to the Board in FY 2018, while closely monitoring progress on potential compact programs with Tunisia and Burkina Faso to ensure successful Board presentations in FY 2019. MCC is also monitoring ongoing governance challenges in Togo to determine the best path forward for the proposed Togo threshold program, while initiating compact and threshold program development, respectively, with Timor-Leste and the Gambia.For program implementation, highlights include the signing on the Cote d’Ivoire compact and the successful close out of MCC’s $66 million compact with Cabo Verde in November, as well as entry into force of the Niger compact in January 2018. MCC is also preparing for close out in Indonesia and Honduras, while closely monitoring implementation progress across the compact and threshold program portfolio. Strengthen organization health and effectiveness. For FY 2018, MCC is focused on three improvements—reforming MCC’s performance management system, implementing targeted efforts to improve knowledge management, and creating tools to better link workforce decisions to agency business needs. For performance management, the agency launched a new recognition program and successfully completed the FY 2017 review cycle utilizing new agency-wide leadership dimensions/guidance. For knowledge management, MCC completed an assessment and is implementing key elements of the KM action plan. On workforce planning, the agency launched an organizational development assessment and continues to make progress on improved workforce demand tools. Enhance operational and technical agility. As described elsewhere in this document, MCC launched an “efficiency challenge” to identify opportunities to improve and shorten the program development process, launched the new Star Report tool to consolidate and streamline reporting, rolled out a new U.S. market outreach strategy, and is piloting new program management tools for country partners to better and more consistently manage—and report to MCC about—compact projects/activities. Advance MCC policy and legislative initiatives. In anticipation of MCC’s incoming leadership team, the agency is preparing several key policy and legislative initiatives for consideration by new leadership. Specifically, MCC continues to engage with Congress to obtain concurrent compact authority for the purposes of making regional investments, with legislation expected to be voted on by the full Senate and the House in early 2018. In addition, the agency has continued efforts to better assess and measure the impact of MCC programs/activities focused on policy and institutional reform. 1. Cabo Verde II closed in November 2017 and updated beneficiary numbers will be available in February 2018. As a result, information on beneficiaries is not included in this document. 2. The table includes estimates for compacts that have ERRs from which income benefit calculations can be drawn. Information for Indonesia is only available for one out of three projects at this time. 3. These estimates do not include the projected beneficiaries of projects or activities that have been terminated or suspended by MCC (Madagascar, Honduras, Nicaragua, Mali, and Armenia). In the case of Madagascar, the estimates account for the compact’s early termination. 4. The Present Value (PV) of Benefits is the sum of all projected benefits accruing over the life of the project, typically 20 years, evaluated at a 10% discount rate. Estimates are reported in millions of US$ in the year that the ERR analysis was completed. Because the PV of benefits uses a discount rate, these figures cannot be compared directly to the undiscounted financial costs of MCC compacts, but must be compared to the PV of costs instead. 5. The table includes estimates for compacts that have ERRs from which income benefit calculations can be drawn. Information for Indonesia is only available for one out of three projects at this time. 6. Column totals may not equal the sum of the individual rows due to rounding.